ceramic mortars, originally uploaded by c_p_lew. I used to be a potter so I love seeing traditional wood-fired ceramic forms in Asia. 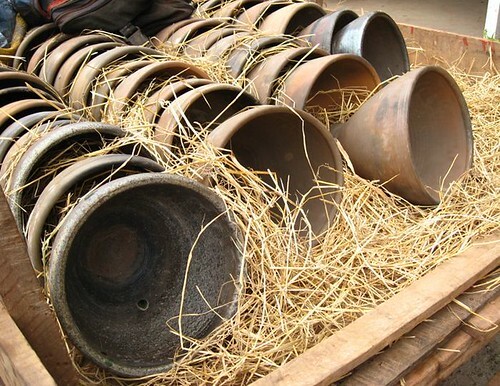 Most potters make different kinds of earthenware jars but these pots are high fired mortars. The sound of a rosewood pestle on the ceramic walls of the mortar while making papaya salad makes everyone's mouth water. There's a picture of a Lao mortar and pestle on Wikipedia! I'm tickled by those little things that have significance only if you're familiar with a culture. Wow. Thanks for this post. I'm thinking about mortars and salad.